Bajaj Dominar 400, the flagship bike of Bajaj Auto has been refreshed with new features and body graphics. 2019 Bajaj Dominar 400 is expected to be launched early next year. Ahead of that, the bike has been spied on test, where notable changes were revealed. Continuing to command a prominent street presence, the new Bajaj Dominar will be seen with features that will make the bike even better in terms of performance. This is thanks to the addition of USD forks in the front, which are inspired by that of KTM Duke 390. Then there is the new exhaust system with twin cannister and integrated catalytic converter. In the older silencer setup, the cat-con was placed below the belly, which resulted in reducing ground clearance. But with the new setup, ground clearance has now improved, allowing to corner better. The bike on test was wearing a license number which as per Govt website belongs to a Hyundai i20. Vibration issues too have been fixed. The new Dominar will not have the same vibration issue which has been reported by some owners of current Dominar. The engine too is updated to DOHC setup and ready for BS6 standard. It will also get updated slipper-clutch and ride by wire system. ECU has been updated to deliver better performance. This might result in engine output numbers. The current Dominar delivers 35 bhp power at 8,000 rpm and 35 Nm torque at 6,500 rpm mated to a 6 speed gearbox. 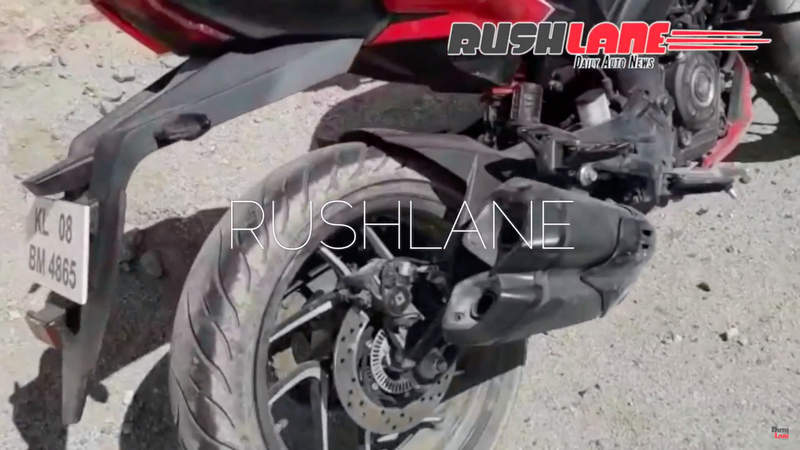 Watch the walkaround video of new Bajaj Dominar below. Instrument cluster too has been updated. In the new variant, the main instrument cluster is very much like the KTM Duke 390’s, in terms of information displayed (average speed, distance to empty, actual fuel consumption etc). The speedometer will have all speed features like seen in KTM. Gear position will be on the small tank display. Other changes include – rear view mirror stalk has been made more stylish, new leg guard, steel braided brake cables, and larger radiator. Just like the current Bajaj Dominar 400, the new one too measures 2,156mm in length, 813mm in width and 1,112mm in height. It gets a 13 liter fuel tank and weighs a total of 182 kgs. It will be available in color options of Canyon Red, Glacier Blue and Rock Matte Black. With these new updates, expect the price of Dominar to be increased by about Rs 15,000. But it will still remain one of the most VFM motorcycle (value for money) in the industry. 2019 Bajaj Dominar 400 will compete against the Royal Enfield Classic 350, Mahindra Mojo, KTM Duke 250 and the BMW G310R.